I've had a good day, just thought I'd share that with the world. Get on board and feel the mood, maybe it's because it's the vernal equinox and we have had a 12 hour day at last. For anyone who is interested, our poinsettia which we have kept alive since Xmas 2010, has started to go red again, not an amazing nugget of Dylanesque information I grant you but a big deal in our house. Life (and the news) should be full of such trivia instead of all the guff we have to endure. You may have noticed that my daubing has taken a decidedly jazzy turn. I have it on good authority that Bob Dylan is collaborating with Robert Glasper on his new album, you heard it here first. Whilst on the ridiculous I heard Michael Bolton ( he of the receding hairline ) on the radio today saying he had cowritten a song with Dylan !!!! Now I did hear him perform this song on tv at an Albert Hall concert, and I heard it as "Steel Balls" and I thought.....comes with the receding hairline mate. 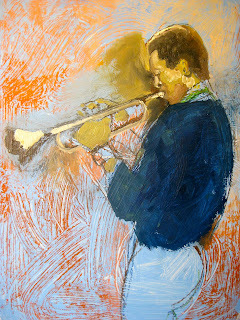 pic is a beginning of a Miles Davis, yes I know it needs work but hey its the equinox.... gotta howl, or is that a full moon.......what the hell.